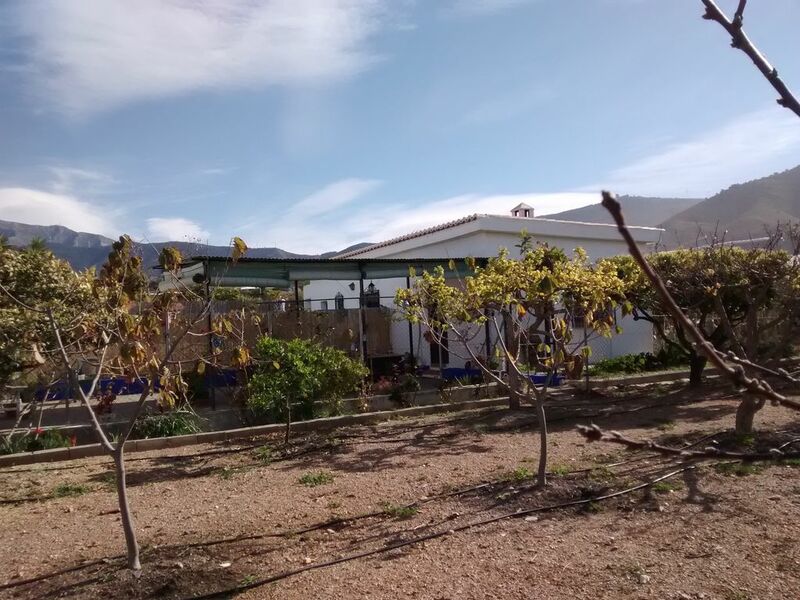 A large detached studio house situated on a rustic finca close to Motril. It has a super king sized bed (can be converted to twin beds), a new double shower and bathroom, a fully equipped kitchen plus a comfortable lounge and dining area. Outside there is a private covered porch area and guests are welcome to use the roof terrace accessed behind my house, which is also within the grounds. A perfect stopover or a comfortable, private place to return to after exploring the local area. There is plenty of parking within the grounds and WiFi included. The local beach is only 4km and is quiet and slightly wild. This area of the coast is not mainstream tourist land but there are plenty of chiringuitos to enjoy a welcome cool drink and tapa on Motril beach. Bigger tourist centres such as Salobrena, Almunecar and Nerja are all within easy reach if you want a change. Motril town, also only 4km, is a typical Spanish town and has many shops, restaurants and bars as well as a thriving nightlife. It is steeped in history and there are many beautiful churches and museums to explore. Summer is the time for open air concerts on the beach and in town, with everything from flamenco to jazz and classical. The Calderon theatre is a wonderful place to spend an evening too. The port, next to Motril beach, has daily ferries to Morocco with or without your car. The house is easily accessible from the new exits recently opened on the A7 and this motorway will now take you to Malaga, Granada or Almeria in just over an hour. The Alpujarra mountains with their beautiful whitewashed villages can be reached within 30mins and are a delight to explore. The Alhambra Palace is under an hour, reached by a spectacular drive, and the ski resort a further half hour up the beautiful winding road into the Sierra mountains. Painting and walking enthusiasts are in their element with some of the most spectacular scenery and mapped walking trails within easy reach. All in all there is something for everyone here, just laying on the beach, hiking or culture - whatever your interests! I am happy to help or give advice on local information to make your stay the best it can be! From the moment we arrived we felt welcomed and at home. The detached cottage is atmospheric and very clean and comfortable, with nice furnishings and a very large and comfy bed. There is a sleeping area, lounge area with TV, sofa, table and chairs, a fully equipped kitchen and modern bathroom with a large and powerful shower. There is access to a washing machine and plenty of drying area. Outside there is a large table and various chairs, sunbeds, a hammock and swinging chair. There is a wonderful roof-top patio with views of the sunset over the sea and mountains on the other side. The host, Michele, who lives in a separate house on the property, is very welcoming and is a mine of information on places to see, where to eat out, nearest supermarkets, shops etc. When we were confused about where to get the best free tapas, she took us to one of her favourites and explained the menu for us. It was a lovely evening. Michele also advised us on the best beaches, particularly for snorkelling, and had beach umbrellas to borrow. There are two friendly dogs and a cat at the property, who aren't allowed into the cottage, so no worries about allergies. They're well behaved and not pushy, so if you're not sure about dogs they're no problem. Michele grows all sorts of fruit trees and veggies on the land. We were there in October and there was a constant supply of fresh, sweet, exotic fruits! We had such a peaceful and relaxing stay and would highly recommend it for those who want something more than an apartment in a large block. It gave us a taste of what it is like to live in Spain, away from the tourists. We will definitely go there again. Getting there: You need a car, and we easily found it by putting the coordinates Michele had sent us in advance into Google Maps. Absolutely fantastic- Michele exceptional hostess-welcoming,friendly incredibly helpful and has a wonderful home. Thanks Trevor! I am very happy that you and Deborah enjoyed your stay at Casita Azul and look forward to welcoming you again soon! Nous avons été très heureux de notre séjour à Motril, Michèle est une hotesse chaleureuse et discrète, toujours disponible pour un bon conseil. Le studio est charmant, propre et confortable dans un délicieux jardin encore plus fleuri que sur les photos. Même si la ville de Motril n'a rien d'extraordinaire, sa situation géographique est idéale pour visiter cette magnifique partie de l'Andalousie. The property is not easy to find, but that's about the only (and pretty trivial) complaint here. About the apartment itself: It's comfortable, well planned and easy to keep cool during summer. The beds are comfy, the shower is spacious and the kitchen equipment leaves nothing to be desired. Sitting outside in the evening is the perfect end to any day exploring Andalusia. The impressive garden is really pretty and offers one or the other delicacy. The dogs are curious, well-behaved and very friendly. Just keep an eye on anything you leave on the outside table. The location is a good starting point for visiting Granada, the Alpujarras, the Sierra Nevada or even Córdoba and Seville. Motril itself is 10 minutes by car, and offers a wide variety of shopping facilities, restaurants, bars and beaches. Michele is a wonderful and very helpful host. She had quite a few useful bits of information on the surrounding localities for us and introduces us to a great tapas bar we would've never found without her. I'd definitely recommend this apartment to anyone traveling Andalusia alone or in pairs. Super séjour à la casa azul! Maison typique, fleurie, agréable on se sent comme à la maison! Le calme et la tranquillité sont les mots qui me viennent immédiatement. MICHÈLE est adorable présente pour nous apporter des conseils et elle est aux petits soins. Merci pour vos petites attentions (fruits du jardin)! Si l occasion se présente je reviendrais. The area is ideally placed for easy access to a multitude of activities. The local mountains have wonderful hiking trails and scenic sea views ideal for landscape painting. The nearby alpujarras offer picturesque whitewashed villages to explore or sketch being nestled in beautiful valleys or perched on the mountainsides. There are 2 golf courses, tennis courts and gyms nearby if that is what you are looking for. The beaches are quiet out of season although enough chiringuitos open all year. In summer most local beaches offer watersports and beach sports such as volleyball. There are many beach bars and restaurants that come alive through the summer well into the early hours. The ski resort is 1.5 hours drive away, usually open from November to May, and is easily accessible for a day or weekend visit. The drive is spectacular! There are also the cities of Granada and Malaga, both beautiful and interesting just over an hours drive away. In short, if you look at the location of Motril on a map, you will see that we are not very far from all leisure activities which is why I love it!